it's been a while but i am still modelling , just not enough time. I thought that I would break the ice with my latest build that I just completed. I will include some progress shots in the Vbench 'models in progress' to show the journey as well. PANTHER G [LATE MODEL] LAST STATION STEEL WHEEL PRODUCTION M.A.N. 1./SS PR 1, LSAH - Lake Balaton Hungary 1945. March (around the 23rd) 1945. 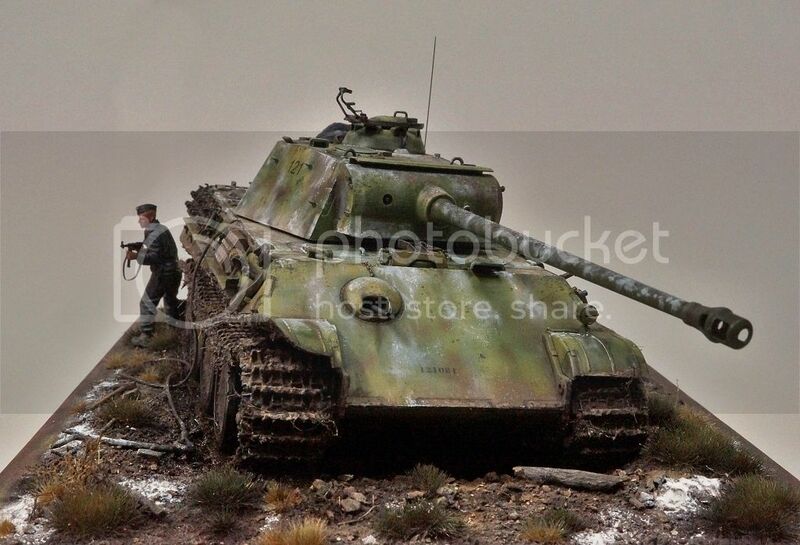 Panther 121 was destroyed in the last winter on the Eastern Front as part of the final German offensive of the war. 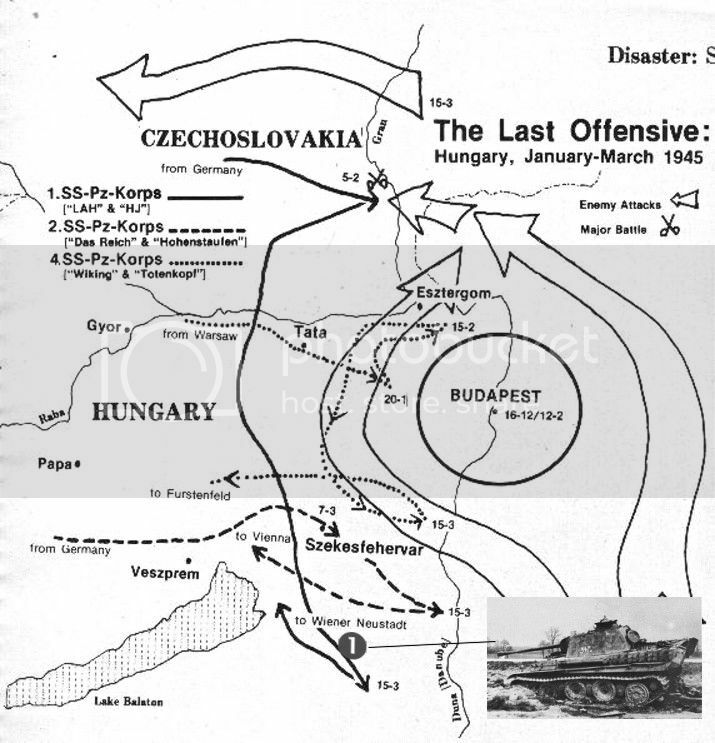 Operation Konrad was Hitler's last gasp in the east to stop the Russians in Hungary. 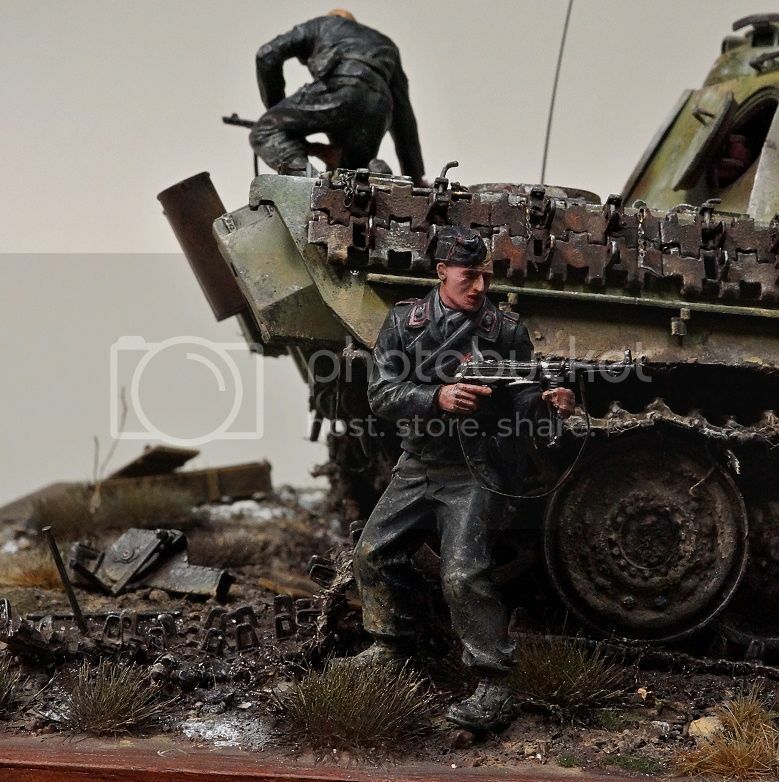 The battle was fought out between Budapest and Lake Balaton to the south and was quite open country for tank warfare. The troops in the east did not get resupplied with winter whitewash in the final winter apparently, and had to make make do unless they had access to previous supplies. This shot shows vehicles in Dark Yellow during this period in the area in question. 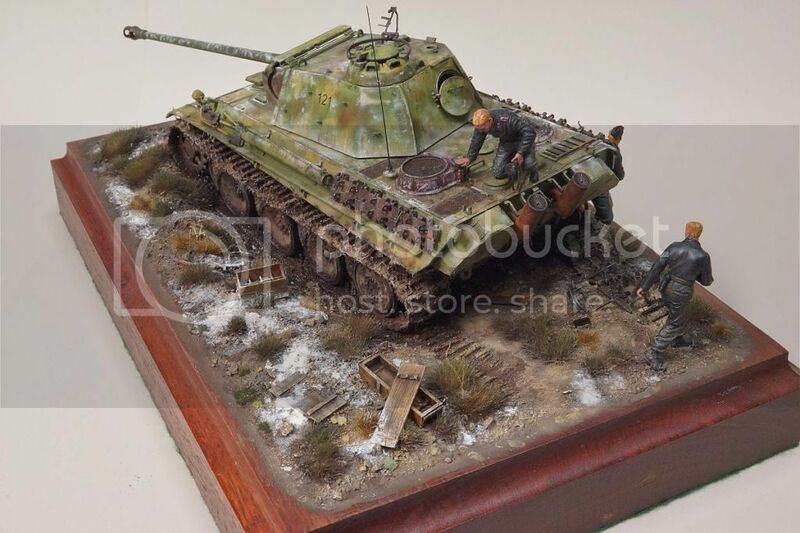 A Panther with some interesting aspects. - Last Station steel wheeler from M.A.N. - turret cammo loops installed. - This also does not have the typical hard edge 2 color cammo scheme that is associated with the final M.A.N. variants with LSSW. 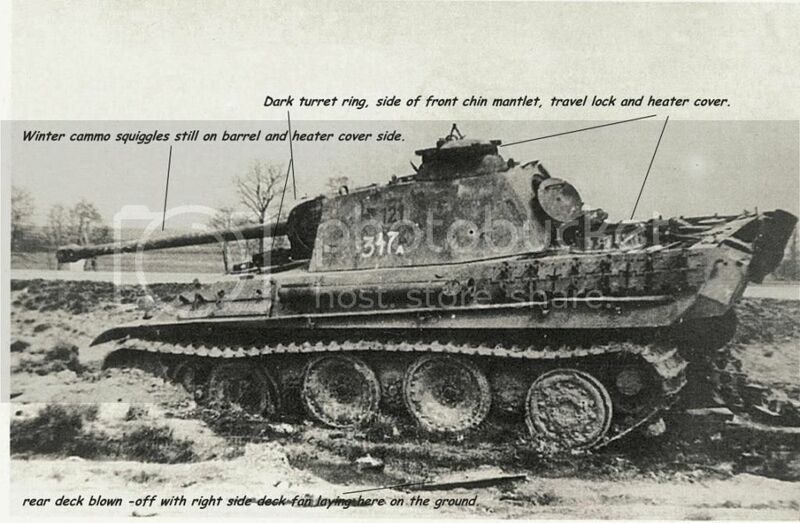 "Panzertracts 5-3 states that steel tired roadwheels were fitted in March and April 1945"
However, it shows details typical of the late production G from M.A.N. (Dec/Jan 45). Most of the other examples that have shown up in photos have typical Final production series features from M.A.N. (March - April 45 - some differences visible are highlighted in black above)but there are a small number like this though it is hard to see all the features. One of the features of the final series is the fitting of turret loops for cammo attachment on the sides of the turret - this is a special example as it has this feature in conjunction with a Dec/Jan production series as well as a LSSW and AA cupola ring fitted. A final detail is the fact that this vehicle has a standard starboard side stowage bin, no I.R. box - apparent in another photo of this vehicle that I do not have but is quoted by sources on ML. 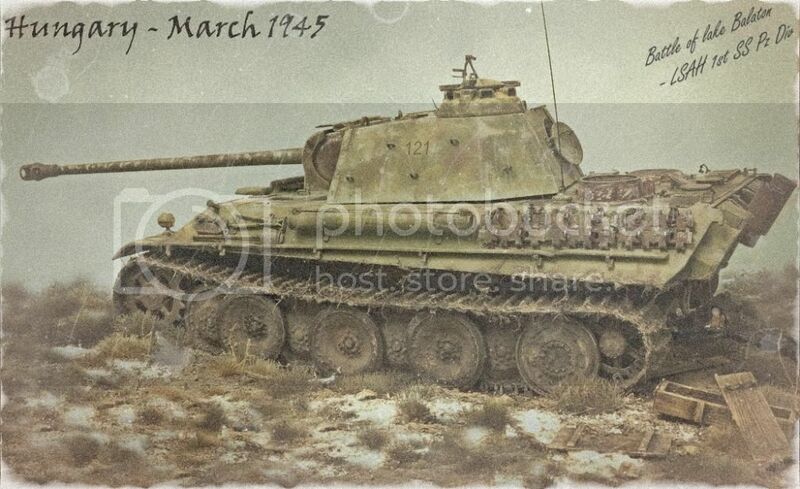 I have guessed out the cammo using the known factory painting orders issued for the end of 1944, based on this vehicle being built during the DEC/JAN period and experiencing the chageover from red primer factory base to green. 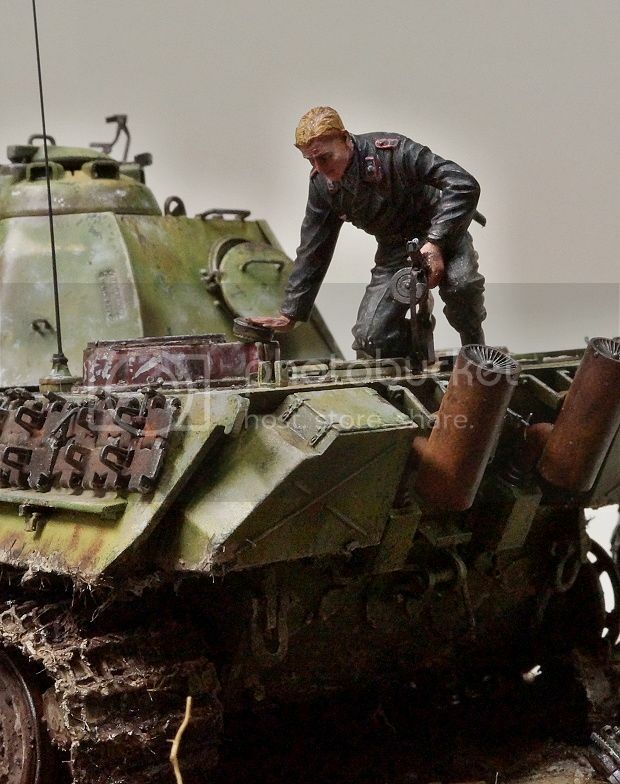 Some of the curious aspects of the cammo on this tank are found in the areas that at first glance seem to be part of a 'flame-out' effect from the explosion that blew off the rear deck and the forward hatch. However, the rear heater housing for the engine deck fan is very dark, but still retains the white Winter Cammo squiggles, so this surface cannot be burnt paint. The barrel also still retains the squiggles. The front Chin mantlet side is also very dark, and this may be a result of an internal fire coming out from the font hatch[which has been blown-off], however the paint work around the hatch does not show any evidence of fire and the dark appearance may be just a dark color such as cammo brown or a dark green. The same goes for the the Commanders cupola and AA Ring. The ring and the cupola casting seem to be in a dark color, but if this was fire damage there is no heat damage or flame damage to the hatch or turret top or rear. The rear hatch which is open, would have allowed flame and fire to come out but the rear turret plate does not have any fire damage either. So after all that it is a difficult subject to consider and build as a reliable color subject. - Raised heater fan added from Nov 1944. - Gas Tab mounts Oct 1944. - Zimmeritt coating discontinued after September 1944. 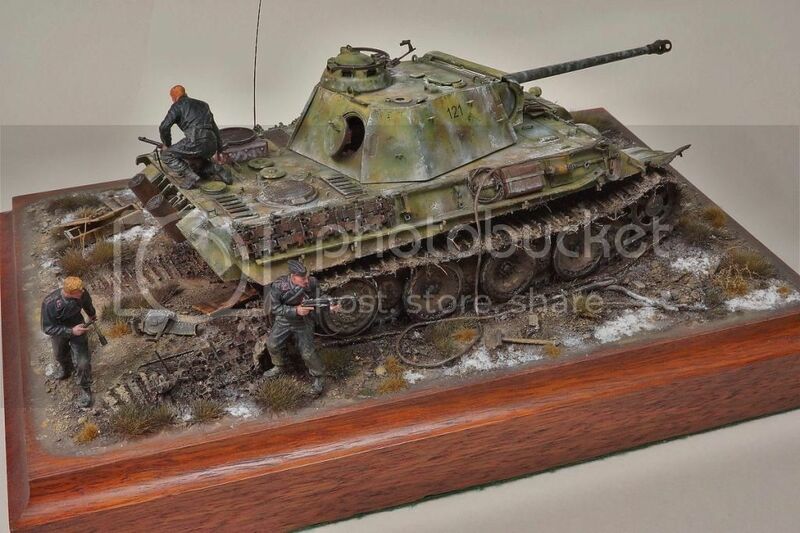 Tanks then no longer coated in Dark Yellow but in Red Oxide Primer with some Dark Yellow patches. - At the end of October 1944, MNH received the order to sparingly cover the red oxide with Dark yellow, Olive green and red-brown. This was followed by another order in mid December to paint new G models with Dark green overall with re-brown and dark yellow cammo (hard edge). - Red oxide interior to be once again coated with ivory in Feb. 1945. (I have left my inerior in red oxide. - turret cammo loops fitted beginning September and randomly continuing as a mod. to February, after which they became standard. 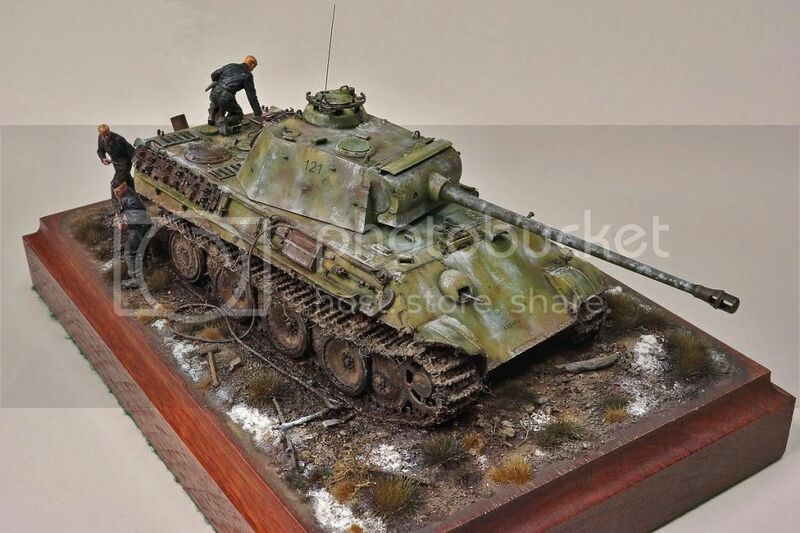 So as a result I am going to go with a Dec 1944 model that has been base coated with Dark Green and then lightly over-sprayed with Dark yellow and the odd bit of cammo brown. This was then modified by the new owners with field winter cammo and a messy additional cammo. Further to this I am going to model the rear raised fan cover as a dark red oxide fitted as after the green base but left in red oxide as per the previous order as it was built on the eve of the change order. 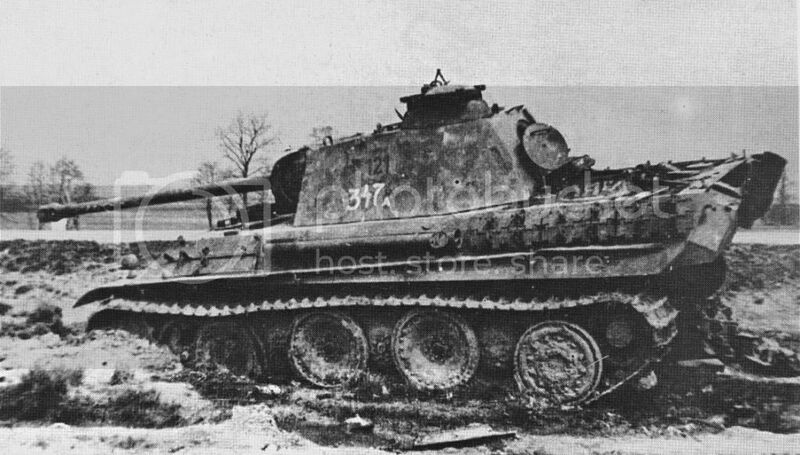 Lastly we have a faded winter cammo that has nearly disappeared but can still been seen on the turret side, chassis deck top and a little on chassis plate side. I have modeled the tank before the internal explosion that has been set off by the crew, and so also before the major damage (i.e. suspension sag and rear deck partly blown off) and the Russian army catologue number '347a'. Last edited by brokeneagle; 06-25-2017 at 05:13 AM.